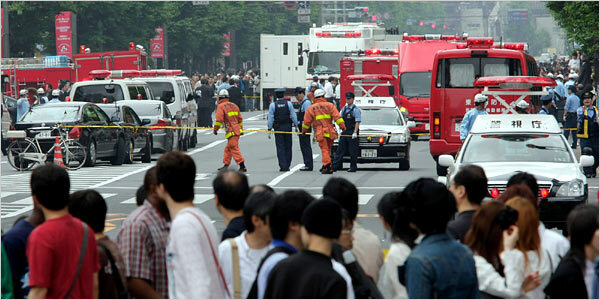 TOKYO – A 25-year-old man “tired” of life went on a killing rampage in a busy shopping area in central Tokyo on Sunday, plowing his truck into a crowd of pedestrians before stabbing passers-by with a survival knife. Seven people died and 11 others were injured in the attack. The attack took place shortly after noon on a main thoroughfare that had been closed off to vehicles for the day in Akihabara, the main district for electronic goods in Tokyo and a magnet for fans of Japanese anime and manga comics. The location, as well as the number of fatalities, stunned a country that has long enjoyed low crime rates but has recently experienced random stabbings in less-high-profile areas. The police identified the attacker as Tomohiro Kato, who was living by himself in a small apartment in Shizuoka, a prefecture just west of Tokyo. According to the Japanese media, Mr. Kato told the police that he had grown “tired” of life, “hated the world” and had gone to Akihabara to kill people. “Anyone was O.K.,” he told the police, according to the Japanese media. This mass murderer hit people like us in the place we would have felt safest. Especially with people who are typically not the most aggressive in society. That’s why it hurts so much, and we at Anime Diet send our thoughts, prayers, and grief to the epicentre and the birthplace of so much of our entertainment and joy. It’s hard not to wonder, like I did initially during the Virginia Tech shootings (which took place in an Engineering building), whether this is something of a “geek hate crime” aimed specifically at otaku. From what we know now, it doesn’t appear to be, just as it wasn’t in VTech. The killer appears to be connected to the yakuza, and said “anyone would do.” It takes a special kind of callousness, I think, to simply pick out purely random victims, each of whom have names, have stories, have families and friends. Sometimes in our concentration on our various anime and manga fantasies, we forget there are real people producing it, real people buying it. May all otaku worldwide unite in mourning and in solidarity with our fallen brothers and sisters in fandom. As a minister-to-be, I would like to offer the same prayer that I offered after the Virginia Tech massacre, from the Book of Common Prayer. Today we are reminded, O God, of the slaughter of the holy innocents of Bethlehem by King Herod. Receive, we pray, into the arms of your mercy all innocent victims; and by your great might frustrate the designs of evil ones and establish your rule of justice, love and peace; through Jesus Christ our Lord, who lives and reigns with you, in the unity of the Holy Spirit, one God, for ever and ever. Amen. Previous PostClinton and Obama Reconciled by Becoming Chibi, CaramelldansenNext PostThe Holy Land is under attack! But I am asking: why do you have to put a god into that terrific event? Especially as for the sake of god crusaders’ve committed a lot of massive murders accidents? when thousands of people died because of the witch hunting in Europe? why such a god should be mentioned? or maybe you mean some of the Shinto gods – if yes I don’t have anything against. Why not include God? Many people, perhaps yourself not included, find peace and comfort in God. All Michael is trying to do is to give a passage of comfort for a truly horrible event. I’m sure you know that humans use a lot of excuses to justify their actions, no matter how wrongly. To say “God is with us” or “God told me to” are just some of those methods of denial when they are doing some awful things that goes against all the teachings of the Bible, the Quran. That is human nature. To blame the actions of those people on God such as you have done is also human nature. If only we could pinpoint such an “external cause” of humans committing such tragedies instead of analyzing the pitfalls of humanity that has lead to such actions. I don’t really know what to comment with, but I know I should say something. Thank you. Stuff like this happens all the time. Best we can do is to move on and pray for the best. @me: I am a Christian, and a future pastor to boot; to offer prayer and comfort in the time of death is an important part of what I believe is my business here on earth. It’s not meant as an imposition or a forcing of belief on others, or even a form of “evangelization”; I’m just asking for mercy and comfort from the God I believe in, perhaps with the hope that others who believe similarly can join along. You may differ, and that is your prerogative, and I respect that. @Jerry: thanks for a better articulation than I probably could put together for myself. Pingback: Anime Diet » The Holy Land is under attack! Thank you for printing the names and brief descriptions of the victims. You’re absolutely right – they had names. They were persons, with stories, histories, experiences, loves and losses, relationships, friends and families. You’ve said it so well; it takes a special kind of callousness to kill people just for the sake of killing. As an American I don’t understand how this could happen in Japan, or at Virginia Tech. But crazy violence can happen anywhere. One gasps at the meanness of it. But then, we all have to understand evil, which is invariably merciless. I look forward to your ministry. “Save as many as you can.” Terry Rapson, from the movie, “The Day After Tomorrow.